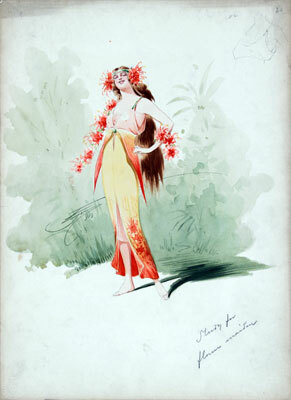 Signed and dated watercolour and pencil design by Attilio Comelli for a Flower Maiden in Parsifal (1914). She is depicted wearing a headdress of orange spiky flowers, and a dress with a pale pink bodice and a yellow skirt that has an orange lower section. Draped around her shoulders is a garland of orange spiky flowers.